We flew with WOW airlines, hand luggage only to Keflavik, the ex American NATO airfield now used as the international airport for Reykjavik. 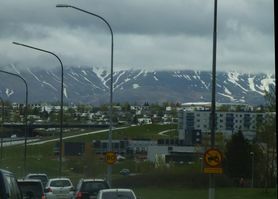 We hired cars, drove through a lava field into Reykjavik to pick up Deb and Barb and then headed east. We crunched our way in snow to a lava tube with icy stalagmites and stalactites, then drove on to a geothermal park where we saw steam rising from the ground for the first time. Getting the idea this place is different. We drove to a B&B past Selfoss. This was our first experience of a long daylight. The sun does eventually set but there is only a twighlight, no darkness! Steam rising from the ground at the Hveragerdia thermal park. We did the Golden Circle route visiting the Pingvellir National Park. The park contains the site of the first Alpingi (parliament) held over 1000 years ago. It also covers part of the mid Atlantic ridge where the north American plate and the Eurasion plate diverge at 2.5 cms per year. So as a result there were a few geysers and waterfalls to see, and evidence of lots of past volcanic activity. Many more highlights as we travel east towards the coastal town of Litil Hof. 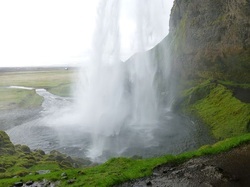 First it was Seljalandsfoss, then Skogafoss and then the area that just escaped major damage when Eyjafallajokul erupted in 2010 and disrupted air traffic all over the world. There was not a lot of damage on the ground. Then a lot of volcanic highlights including the black beach and basalt structures, amazing countryside that looked touched up before we entered a glacial region. The weather has been cold, windy and sometimes wet but we keep warm enough when outside and it doesn't seem to worry us. Today we set off to see more of the glaciers we'd had a taste of yesterday. We stopped to see a glacier lake complete with icebergs and seals before driving on a little further to Jokulsarlon to see the icebergs floating out to sea or getting stranded on the black beach. There was low cloud, snow 2 metres high beside the road and the temperature went down to 1°C as we crossed a range on our way north to see the puffins. 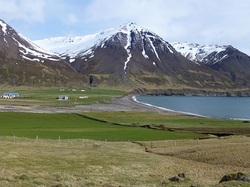 We had a good guesthouse overlooking a bay with birdlife including harlequin and eider ducks, barnacle and grey lag geese and arctic turns right at our windows. We drove around to the puffin rookery for some great viewing fun. We headed west into a higher area which was still snow covered. Lucky to spot an arctic fox as well as a few geese living in the area. We had to walk through snow to see Selfoss and Dettifoss but they looked interesting with the snow around. It was raining by the time we walked up to the sulphur crusted edge of the Viti volcano and looked into the crater's frozen lake. Nearby was a geothermal plant harnessing the steam coming up from the ground and bubbling sulphur smelling mud pools. But best of all was the soak in the hot pools in the Myvtan Conservation Area. The weather was cloudy as we drove to Godafoss and then Pingeyrar 19th century stone church. It was extremely windy and very cold late in the afternoon. We later learnt that it had snowed where we had been earlier in the day. 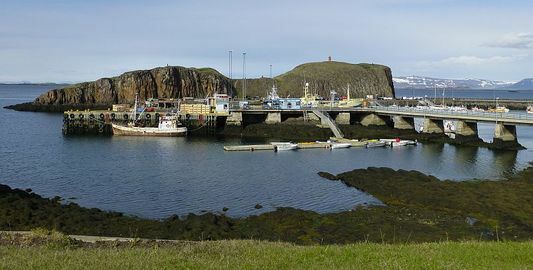 Destination today was Stikkisholmer, a fishing village on the north of the Snaefellsnes Peninsula. This is one of the towns seen in the Secret Life of Walty Mitty movie. 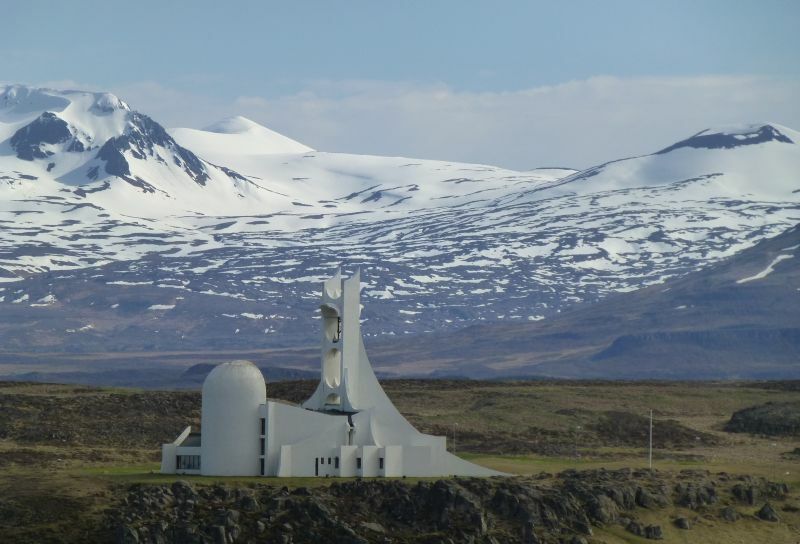 We drove around the Snaefellsnes Peninsula via Londranger and the basalt wall to Reykjavik. 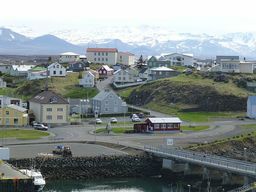 Three nights in Reykjavik to rest and walk around the town before an early departure on 23 May. 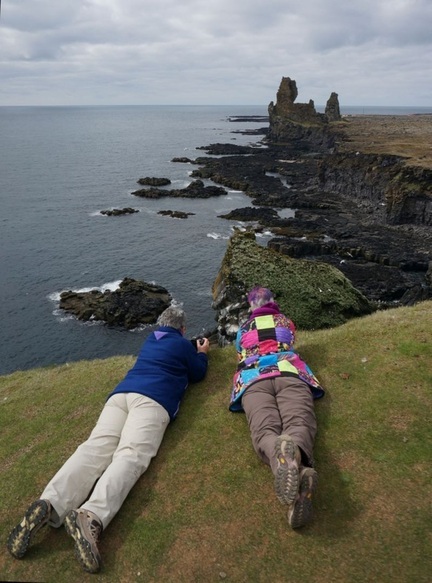 Londranger with its lighthouse, huge gull and fulmar rookery and basalt columns.